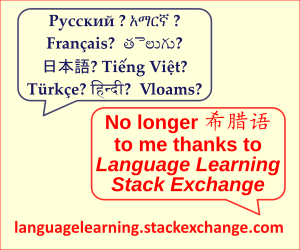 My languages: Dutch, English (C2), German (C2), French (C1), Spanish (A2), Chinese (HSK3), Latin (now very rusty). 36 What is a verb that means "to be said by a computer/machine"? 15 Are there any surveys or studies on what motivates people to learn minority languages and/or rare languages?